locally called "The Castle", overlooks the Mt. Irvine Golf Course in Tobago, with view of the Caribbean Sea. 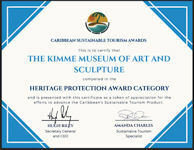 When visiting Tobago, a visit to the Kimme Museum is a must. There you can admire the larger than life size sculptures made from oak, cedar, lime, cypress and bronze, depicting perfect portraits of the beautiful Tobagonians.